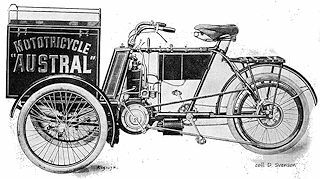 Founded in 1905 by Edouard Cheilus in Paris, France, Austral motorcycles produced a tricar in the same year. Available as either a passenger or goods vehicle (the difference consisting of either a seat or a box between the two steerable front wheels, the Austral was detailed by the Motor Cycle magazine as the most up-to date tricar at the Paris Motor Show of 1905. The Austral was initially powered by an Aster 3.5hp, water-cooled engine via a 2-speed gearbox although this was soon replaced with a 4.5hp engine thatr also drive the single rear wheel although this time via a 3-speed gearbox. Development of the Astral continued and by 1910 the vehicle boated an 8 - 9hp, twin-cylinder engine and now also included a number of luxuries like a better padding on the seats (for both driver and passengers and a pram hood. Production ceased in 1914. A 1905 Austral Goods vehicle.